Campylobacter fetus, a less frequent cause of enteritis, is the most common cause of extraintestinal disease; other Campylobacter species that may also cause extraintestinal disease include C jejuni, C coli, C laridis, C sputorum, and C hyointestinalis. C fetus infection may manifest as fever, chills, and myalgias, without definitive localization; additionally, this organism displays a propensity to infect vascular structures. Endocarditis, intravascular infection of abdominal aortic aneurysms, and septic thrombophlebitis with vessel necrosis have been reported. Fetal death, even with appropriate antibiotic therapy, may occur. Fetal complications most commonly occur during the second trimester of pregnancy. Additional manifestations may include pericarditis, meningoencepalitis, septic arthritis and osteomyelitis, spontaneous bacterial peritonitis, salpingitis, empyema, and cellulitis. In cases of suspected extraintestinal campylobacteriosis, cultures should be plated on nonselective 5% sheep's blood agar and incubated at 37 °C in a microaerophilic environment. Subcultures from blood culture broth systems should be handled in a similar fashion. Identification of C fetus may be accomplished by testing susceptibility to cephalothin (susceptible), growth inhibition at 42 °C, positive catalase reaction, and characteristic Gram stain morphology. 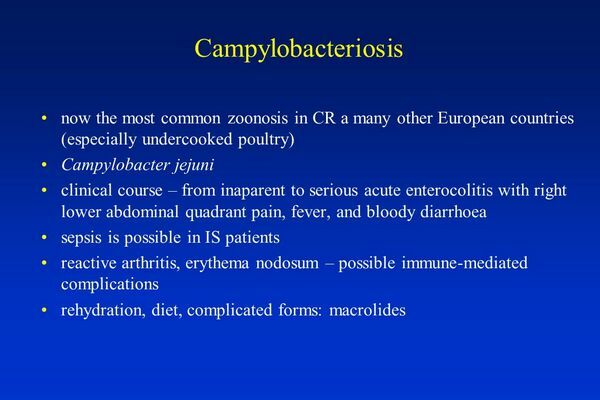 The differential diagnosis for Campylobacter enteritis includes all enteric bacterial, viral, and parasitic pathogens. This differential is usually resolved by clinical history, stool culture, ova and parasite examination, and, if necessary, viral testing (ELISA, culture, or electron microscopy). The differential diagnosis for extraintestinal campylobacteriosis varies according to the site involved. Although C fetus may be identified by routine blood culture methods, the incubation conditions used are not optimal for isolation. A high index of suspicion must be maintained since special bacterial culturing techniques may be necessary for optimal recovery of the organism. Like other bacterial enteritides, complications of Campylobacter enteritis include volume depletion and electrolyte imbalances. 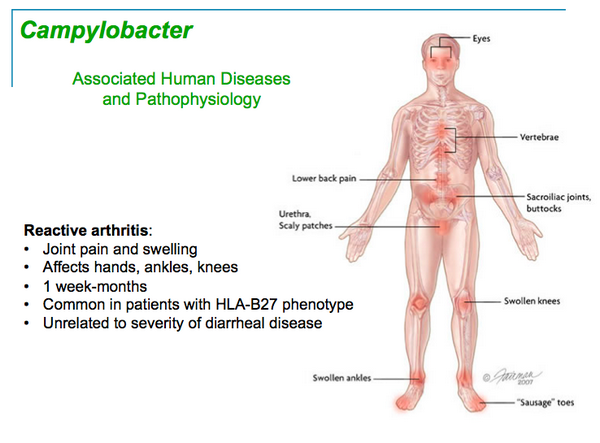 Patients with an HLA-B27 phenotype may develop postinfectious arthropathies (Reiter's syndrome) similar to that produced by other bacterial enteric pathogens. Guillain-Barre syndrome rarely occurs following Campylobacter enteritis. Guillain-Barre syndrome has been associated with autoantibodies directed to N-acetylgalactosaminyl GD1a, GD1b or similar epitopes. Similar epitopes have been shown to occur in the lipopolysaccharides of C jejuni and may represent the immunogenic stimulus. Extraintestinal disease may occur as the result of septicemia and include septic thrombophlebitis, abscess formation, and endocarditis. Fluid and electrolyte replacement therapy is of principal importance (Box 7). The benefit of antibiotic therapy for enteric campylobacteriosis remains to be determined. Antibiotic treatment is indicated in patients with high fever, bloody stools, worsening clinical symptoms, or greater than eight stools per day. Erythromycin is the drug of choice for children. Ciprofloxacin is an alternative therapy for adults. Point mutations in the DNA gyrase gene, gyrA, have been shown to confer quinolone resistance. This may occur during therapy; therefore both antimicrobial susceptibility data and close clinical follow-up are required. Parenteral antibiotics should be administered for extraintestinal disease based on the results of antimicrobial susceptibility testing. Endocarditis requires at least 4 weeks of therapy. Depending on susceptibility, central nervous system infections should be treated with ampicillin, a third-generation cephalosporin, or chloramphenicol. Severe dehydration and electrolyte imbalances may cause death. This most frequently occurs in children, particularly in underdeveloped and impoverished areas that lack adequate healthcare. Long-term sequelae such as Reiter's syndrome or Guillain-Barre syndrome, although infrequent, may be disabling. Extraintestinal disease caused by C fetus may contribute significantly to morbidity and mortality in immunocompromised patients. These patients may be at increased risk for bacterial enteric infections and associated extraintestinal disease. Infections may be persistent and more severe than in normal hosts. In these patients, the time to initiation of appropriate antibiotic therapy is an important prognostic indicator. Pasteurization, washing foods when feasible, thorough cooking, and hand washing are useful preventive measures (Box 8).